If you’re anything like me, your first experience with the direct sales industry is probably with Avon or Tupperware (both of which are still going strong today). In fact, our Avon Lady would make the rounds once a month, going door-to-door saying, “Avon calling.” My mom would let her in, and she’d show us all of her new products and goodies. As a kid, I loved looking at all of the makeup, lotions, and perfumes. Today the direct sales industry has exploded, there are literally hundreds of companies with thousands of products. And women everywhere are cashing in by selling products through in-home parties and digital sales. While some of these direct sales companies have significant startup up fees, there are many that you can start for as little as $100 or less — some business opportunities are even FREE! So if money is tight, here are some home businesses with low startup fees (companies are listed from lowest to highest startup cost). Selling much more than their name implies, Linen World sells linens, toys, home decor, organizational solutions, kitchen products, and much more. Linen World is absolutely FREE to join. Earn 20 percent commission on all sales. fibi & clo is a direct sales company that sells gorgeous, embellished sandals, flats, and boots. The opportunity is FREE to join. Ambassadors (first-level) receive their website for free as well, but once you move up the ranks to a Fashion Agent (and above), you'll be charged a $10 monthly fee. Commission amounts are based on your sales level and rank. Teespring is a FREE platform where you can create apparel, coffee mugs, bags, home decor, phone cases, and more! To get started create a free account and then create your products. Once you hit the publish button, your designs will be featured on their site for sale. There are many factors to figure in when calculating your earnings, from the type and quality of products used to how many sales you generate. Play around with the platform to get an idea of how much you can earn. Fuller Brush Company sells household and industrial cleaning products, personal care items, and more. Consultants earn 20-46 percent commission on retail sales, and the basic business building kit is just $5.00. Buskins sells printed leggings and shirts for women and little girls. The cost to join is $9.99. Affiliates earn 25 percent commission on personal sales and a $5 referral fee for new affiliates that sign up under them. With your startup package, you'll receive a replicated website so you can sell items online. Labella Baskets sells gift baskets, personalized gifts, plantable greeting cards, candles, charm bracelets, and more. You can join this direct sales opportunity for just $5.00 for the first month; after that, it's $24.95 a month. This fee includes your website, training, and back-office. Consultants earn 20-40 percent commission on personal sales. Jewelry Candles sells candles, soaps, and bath bombs with a hidden jewel inside. The startup cost is just $10 to join, and consultants can earn 20-25 percent commission on sales. Bella Branch sells personalized photo jewelry. Affiliates can earn 25 percent commission, and the initial startup fee is $19.95. There is also a monthly fee of $12.95 for your website. They currently have a deal where you can earn $5 for joining and an additional $10 for each new affiliate who signs up under you. Did you know that Avon is rated the number one direct sales company in the world, with net sales reaching over 11 billion in 2011 alone?! Avon sells old-time beauty favorites like Skin So Soft and new and exciting skin care products like the ANEW product line. Just $25 to get started. Jafra sells innovative, high-quality skincare, fragrance, makeup, and bath and body products. Their business opportunity starts at just $29. Consultants earn up to 50 percent commission on sales. The Jafra business opportunity is available in 18 different countries. doTERRA sells essential oils, diffusers, and other wellness products. You can get started for as little as $35, and your website is free. Consultants earn 25 percent commission on all retail sales. JR Watkins sells natural home care cleaning supplies, gourmet foods, personal care products, and apothecary products. Startup cost is $39.95, and consultants can earn between 25-39 percent commission on sales. Team Beachbody sells the grueling P90X workout system as well as workout programs, shakes, supplements, nutritional bars, and fitness gear. With a low startup cost of $39.95 and a monthly recurring fee of $15.95 – this could be a great home-based business opportunity for the fitness enthusiast. Apriori Beauty sells skincare, makeup, body care, hair care, and health and wellness products. The starter kit is just $49, and consultants earn 20-30 percent commission on retail sales and are paid every Friday. Scent-Sations, Inc. sells gourmet candles, melts, soaps, as well as a skincare line. Startup costs are $49.95 per month and are open to both US and Canadian residents. As a member, you'll be filed under an auto-ship program which includes your website and products; monthly fees range from $39.95 – $100.00 per month. Scent-Sations, Inc. has an A+ rating with the Better Business Bureau. Gold Canyon Candles sells candles, scent pods, warmers, diffusers, home cleaning products, and more. Just $39 to get started. Consultants earn 25-36 percent commission on sales. This opportunity is open to residents of the U.S., Canada, and Mexico. Juice Plus sells juice powder concentrates from 25 different fruits, vegetables, and grains. Startup fees start at $50 and consultants can earn 6-22 percent commission on sales. Juice Plus is affiliated with the DSA and the Better Business Bureau. Java Momma sells organic fairtrade coffee, flavored coffee, loose leaf tea, cocoa (coming soon), and accessories in a variety of yummy flavors like Sea Salt Caramel Mocha and Pumpkin Muffin. Baristas earn 20 percent commission on sales and additional commissions on team sales. Java Momma offers two starter kits to choose from, the Cafe Express Kit for $55 or the Caffeinator Kit for $105. With this opportunity, you're only required to make one sale every three months and your replicated website is free. 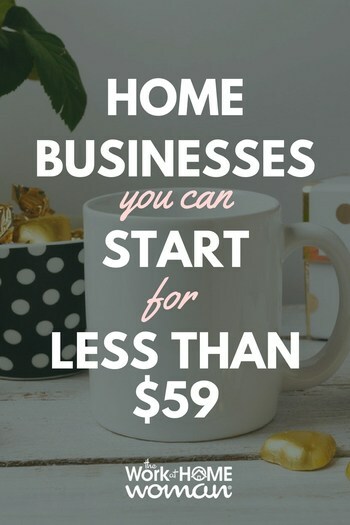 So there you have it, a bunch of home business opportunities for less than $59! Do you know of another direct sales company that offers low startup fees? We would love to know about it — drop us a note below, and we'll consider it for our list. Please note: While all companies listed are believed to be legit, you must do your due diligence and research the company and opportunity extensively for yourself. Many of these companies are ground floor opportunities (new) which means they don't have a proven track record yet. Be sure to weigh the pros and cons when doing your research. Originally published January 10, 2014. Content updated October 20, 2017. I am a distributor of the DXN products containing ganoderma mushroom. The most popular product is the coffee with ganoderma because you might forget to take your vitamins in the morning but never to drink the morning coffee :). Start up fee is 27 USD. Reliv is for people of all backgrounds who want to lead healthy, self-directed and meaningful lives. Reliv offers exceptionally effective nutritional products, a simple and profitable business opportunity and the chance to change lives and provide hope to people around the world. And, you can start your global business with $25. Get started this month as a Tastefully Simple consultant for HALF PRICE! Only $85 to join this amazing company in January. Tastefully Simple consultants offer delicious, easy-to-prepare food items through home taste-testing parties. Simple, delicious, fun! I am a consultant for Cute-Socks! Over 100 styles and very easy on the pocketbook! Get started for as little as $50. For Every Home and Style features eco friendly candles and cubes, warmers (the majority without bulbs), and a spray cleaner that can’t be beat! Also features OAM (odor absorbering molecules)sprays and gels that get rid of the scent of a skunk but won’t kill a fly, you can start for $79 plus shipping. Start earning money now to take care of your Christmas bills!! !